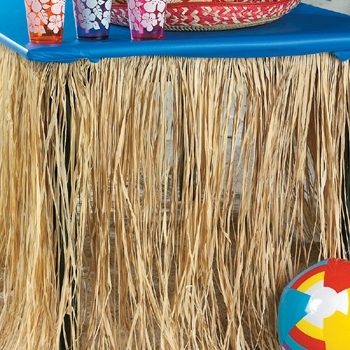 Raffia Table Skirt is 108" x 29"
Raffia Table Skirt - This 9' long genuine raffia luau table skirt hangs down 29". A great accent for your tropical parties! Order this raffia table skirt online or give us a call at (949) 370 - 6535! 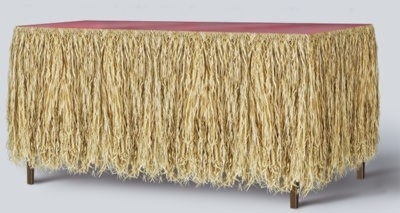 Raffia table skirt looks great! Definitely gives a room that tropical look that I like so well. Turbo-Zoom Shipping & Bomb-Proof Packing, too. ( who could ask for more? ) ~ and Absolutely Perfect, for me! ~ I ( skillfully! ) turned it into a Backdrop for a Bedroom Wall! ~ Thank you so much! Cute - looking forward to using it on our cookouts. It wasn't the speediest of service but I wasn't in any hurry. If I were I would tell them that when I bought the items. But the item is great, and I am going to buy some more!